In addition to the technical visiting CSDI, Professor Sun also visited NTNU and SINTEF in Trondheim. Experts in the Dept. of Hydraulic and Environmental Engineering, NTNU and SINTEF MARINTEK expressed great interest in application of Polyurea in hydraulic concrete structures and potential collaboration in projects in Norway and other countries, especially in regard to the abrasion problems caused by high speed flows with high percentage of sand or sediment and the long-term effects of this type of material. Photo shows the meeting at the Dept. 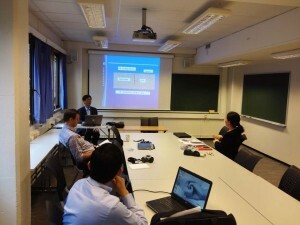 of Hydraulic and Environmental Engineering, NTNU, 01.07. 2015.